The Giants were not at full strength: Captain and second baseman Larry Doyle, who led the team with a .376 batting average, suffered an attack of food poisoning in New York and did not travel with the team.5 Replacing him in the lineup was Heinie Groh, a nervous 22-year-old rookie. 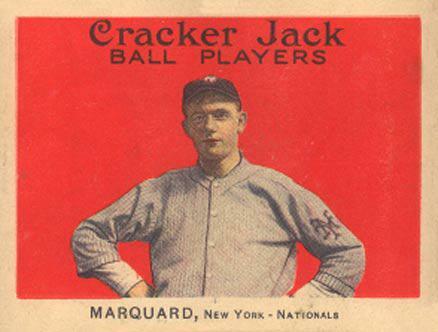 Marquard gave up the first hits of the game, clean singles to center field by Heinie Zimmerman and Tommy Leach to lead off the bottom of the second inning. Vic Saier stepped to the plate and missed two bunt attempts before grounding the ball to second baseman Groh. It would have been an easy double play if Groh had simply thrown the ball to shortstop Art Fletcher at second base. Instead Groh waited in the baseline to tag the oncoming Leach, but the savvy Leach retreated toward first base and Groh chased him unsuccessfully. By the time Groh threw to Fred Merkle at first base, it was too late to get the speedy Saier. And by the time Merkle threw to Fletcher at second base, it was too late to get Leach. Fletcher threw home to get Zimmerman, but catcher Chief Meyers dropped the ball in a collision, as Zimmerman tallied the first run of the game. Johnny Evers tapped a bunt single to load the bases with nobody out. Marquard bore down and fanned the next three batters, but Leach scored on a wild pitch for the second run of the game. An error by Groh in the fourth inning opened the door again for the Cubs. After Leach walked, Groh fumbled Saier’s grounder. Sacrifices by Evers and Jimmy Archer scored Leach and moved Saier to third base, and Lavender’s single brought Saier home. The Giants threatened in the top of the fifth. 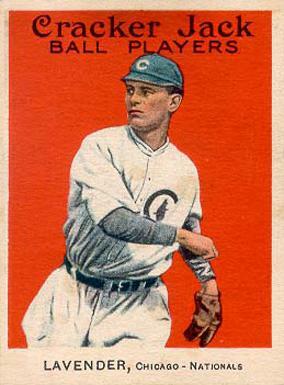 With one out, Snodgrass singled on a “stinger” to third baseman Zimmerman; the ball ran up Zimmerman’s arm and shot 20 feet in the air.7 Becker singled past first base, and Merkle’s single over second base drove in Snodgrass and sent Becker to third. Murray followed with a short fly to right field, close to the foul line; Schulte raced in and caught it, and fired a throw to the plate that kept Becker at third. Merkle and Becker then tried a double steal; catcher Archer threw to shortstop Joe Tinker, who returned it to Archer in time to get Becker at the plate. The Cubs’ defense was snappy while the Giants’ defense was sloppy. In the sixth inning, Saier singled and Evers tripled to the right-field wall. Fletcher made a fine play by grabbing Archer’s grounder and throwing home in time to get Evers. But Snodgrass in left field ran in to catch Lavender’s popup and muffed it, and in his haste, threw the ball over Meyers’ head and into the grandstand, allowing Archer to score. Snodgrass was charged with two errors on the play. Marquard was taken out of the game after six innings with the Giants trailing 6-2. The Cubs added a run in the eighth inning off reliever Jeff Tesreau. Meanwhile, “with consummate coolness and skill,”8 Lavender retired 12 batters in a row over the final four innings to seal the victory. The final score was Chicago Cubs 7, New York Giants 2. Through 2015, Marquard and Keefe still held the major-league record for the longest winning streak in one season. The author relied on game accounts appearing in the July 9, 1912, issues of the Chicago Inter Ocean, Chicago Tribune, New York Sun, and New York Times. 1 Bismarck (North Dakota) Tribune, July 5, 1912; Muskogee (Oklahoma) Times-Democrat, July 6, 1912. 2 F.C. Lane, “James Lavender: A New Star From the Cotton States,” Baseball Magazine, November 1912. 3 New York Evening World, July 8, 1912. 4 Sporting Life, July 20, 1912. 5 St. Louis Post-Dispatch, July 6, 1912; New York Sun, July 9, 1912. 6 New York Times, July 9, 1912. 7 New York Sun, July 9, 1912. 8 Chicago Tribune, July 9, 1912. 9 Sporting Life, July 20, 1912.